Keeping your MN landscape environmentally friendly has been popular for quite some time. The use of natural materials — mainly wood and stone — is very common, as is the use of organic matter for weed control. Water saving has also become a concern for many in recent years, which has led many homeowners around the Minneapolis area to collect rainwater, using filters for the purpose of purifying the collected water. Here’s a link to a previous post that deals in greater detail with any concerns you may have regarding an eco-friendly garden. Exotic plants have obviously been around for as long as gardens have been around. But more recently the use of exotic plants in the design for porches, decks, and gazebos has become especially popular. While many exotic species won’t survive Minnesota’s harsh winter, they do work well as container plants that can be brought indoors when the weather turns cold. Think vivid colors and interesting textures as well as the alluring scents of the tropics. 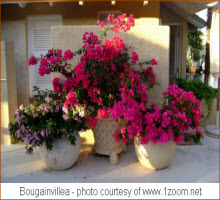 Good examples: canna (which can grow up to 10′ tall and come in a variety of colored flowers as well as foliage), caladium (their pink and purple hues can enliven shady spots), mandevilla (does well in a pot with a trellis support), and tropical hibiscus. Mixing various garden styles is very much in demand these days. Some of the most common include an English-style garden which contains a French landscape zone; another is a Japanese zen garden combined with high-tech water and lighting features. For those unfamiliar, a mono herbal garden is a garden that is partly or entirely composed of perennial herbaceous plants. It does not require much maintenance. But it does demand a large area in order to be properly viewed. It might be a good substitute for an expanse of lawn – you get the overall green effect without the need for frequent mowing and watering. Whether you seek to keep up with the latest trends in landscape design or simply want to keep your yard looking good through the summer, our Architectural Landscape Design Blog can provide valuable tips such as these. And our experienced MN landscape designers are here to help. We can help beautify your yard with a unique landscape plan that shows off your property well and reflects your own personal style. No matter whether your preference is traditional or trendy, we’ll help you bring your landscape dreams to life. Call us today for a free consultation – (952) 272-7717.